Notice the date on the bottom (look closely). 2) Short interview from Feb 16, 2001. "Hudson released her debut album in March..."
5) The June 2, 2001 issue of Billboard Magazine has a review of the album. Q: How many shows have you played since your album came out? A: I was on the Strangely Normal tour with Phil Joel. It was a lot of fun. 7) CrossRhythms.co.uk has a review of the album dated July 26, 2001! 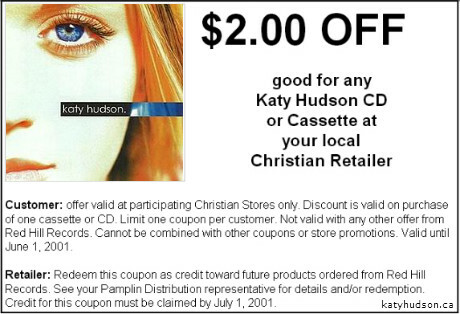 8) Katy's Official Website had a printable $2 off coupon that expired June 1, 2001!